Having friends and family away from us means that The Boy and I regularly travel to visit them, be it interstate or overseas. What this means to us besides the usual must-do’s of catch ups and what not’s is that we get to visit the local places of food and do as many embarrassingly touristy things as possible. My nephew turned one in April this year, The Boy and I made a sweet escapade to Sydney for the weekend and not only did we spend time playing with the Little Monster (LM) we managed to wolf down an amazing amount of food. Here is our round up of our sweet escape. Enjoy! We were without a car in a very first Sydney experience. But due to a big to-do list of #eatallthethings, The Boy and I decided to play full tourists by taking a bus to Newtown. I felt so proud of ourselves 😛 Have not been privilege to take Sydney’s Public Transport in years. We were headed to Newtown for one reason and one reason alone. Gazing out the window of our bus, I spotted our landmark and immediately hailed for the bus to stop. 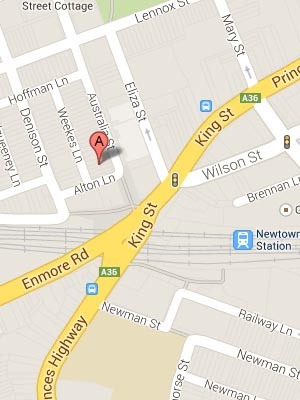 We found the Newtown Police Station! 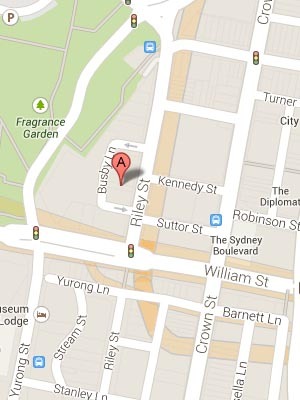 Nestled down the lane which sits the Newtown Police Station (what lucky officers) sits Black Star Pastry. 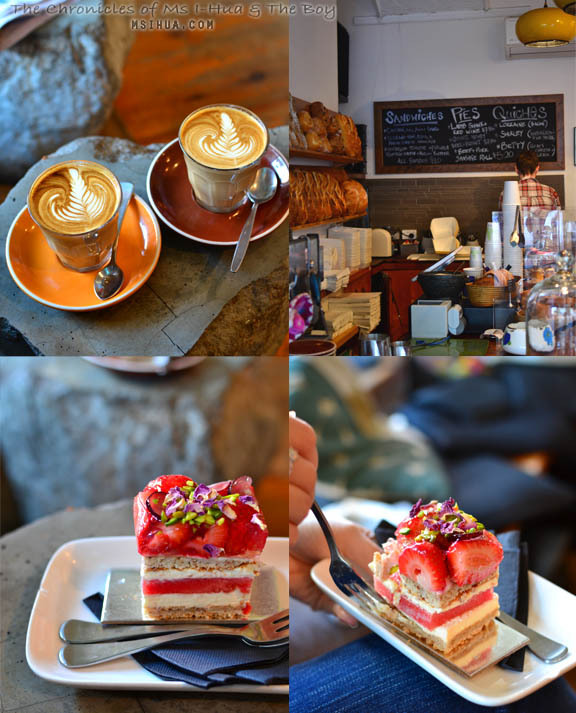 Made famous on instagram by Sydney food lovers, we knew we had to get there on time before the one and only Strawberry Watermelon Cake with Rose Scented Cream sold out. We got there so early, that the cake wasn’t even ready for action! We were told that the cake would be served at 9am so we amused ourselves by sipping on lattes and taking in the atmosphere of the super tiny cafe. Coffees served were robust and strong, perfect wake me up brew. Was the cake everything I had hoped for and dreamt that it would be? It was all that and more. It was light, fluffy and had a whole slice of real watermelon in it!!!!! Perhaps I’d never paid proper attention to the description before but I had never imagined that one of the layers would be made with a real slice of watermelon. GENIUS! Of course we would head up to Flour and Stone as well. After constantly being envious of the stream of pastries and Panna Cotta Lamingtons flooding our instagram feed, we just had to visit and try it for ourselves. Despite not having a majorly sweet tooth, all the amazing pastries still made my mouth water and I wanted to order them all just to document them. The Panna Cotta Lamington, having survived the journey home in my bag after breakfast, lunch and tea was still as good as ever. 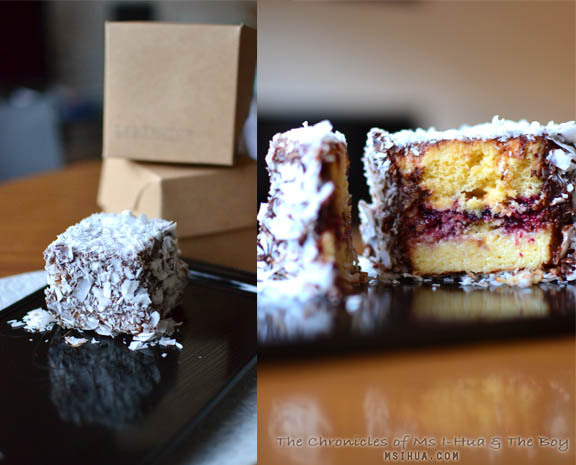 Rich, dense, fluffy and all things amazing, this lamington deserves all the high praise it receives. 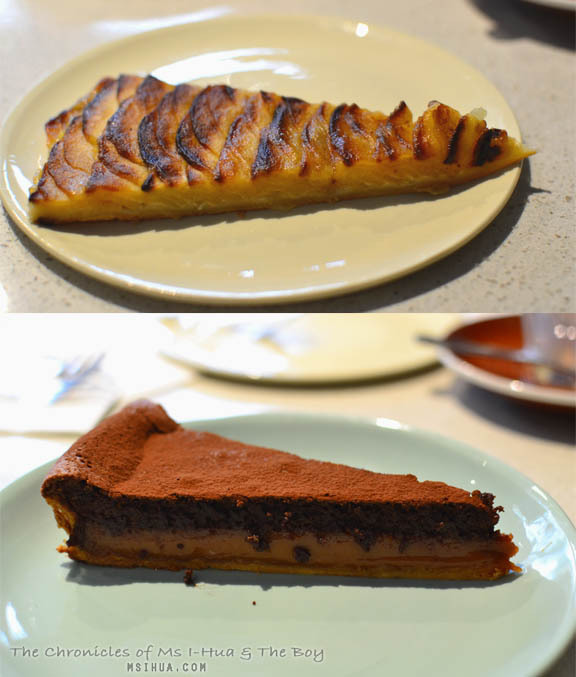 Having revisited F&S twice now (on separate trips), I can say that the Chocolate and Salted Caramel Tart is my favourite item there followed by the hot pies (chicken pie and lamb pie). So much flakey goodness. Is this place worth the fame and hotness factor associated with it? Yes. 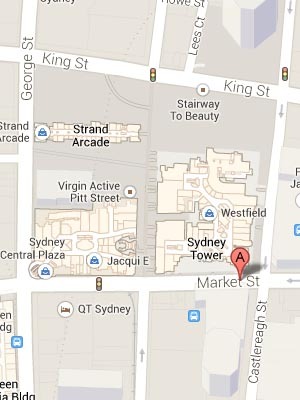 Should you drop by if you happen to be in Sydney? Yes. 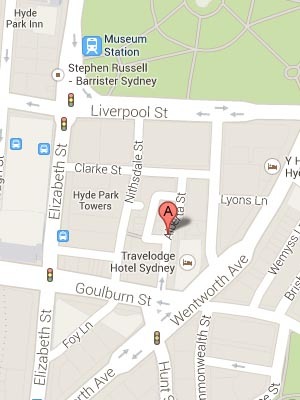 Come even when Sydney is not part of your plan. So you would think that after our meal at Flour and Stone and a full degustation at Bentley that we’d be rolling downhill with no hope of recuperating. How little you think of us then. So after making The Boy walk all the way from F&S to Bentley and then Bentley back to Chippendale (I really try to avoid Sydney’s Public Transport as much as possible to his angst), we went by Cafe Cre Asion, which our good friend Taz recommended to us. He described it as “Amazing macarons with Japanese-esque flavours”. Intrigued, we had to visit. We weren’t disappointed! With classic flavours such as Green Tea and Jasmine to the more exotic sounding Bamboo Charcoal, Kinako (roasted soybean), Cassis and Hoji Tea, we bought a little box of 8 to enjoy at home. On top of the flavours mentioned previously, we also tried Lychee Strawberry (with a surprise strawberry jelly centre) and Salted Caramel. The most interesting flavour would have to go to the roasted soybean which had a rich miso flavour. My favourite was the Hoji tea as it reminded me of genmaicha. A close second would have to be the Lychee Strawberry. This is a cute macaron shop which takes a little bit of searching for, but like a treasure hunt, the end result is certainly worth the hunt. The following day (in between Jamie’s Italian, Chef’s Gallery and Ippudo) as The Boy and I were strolling around Pitt Street Mall on our way to the Opera House (again we walked the whole way, not a big deal okay! 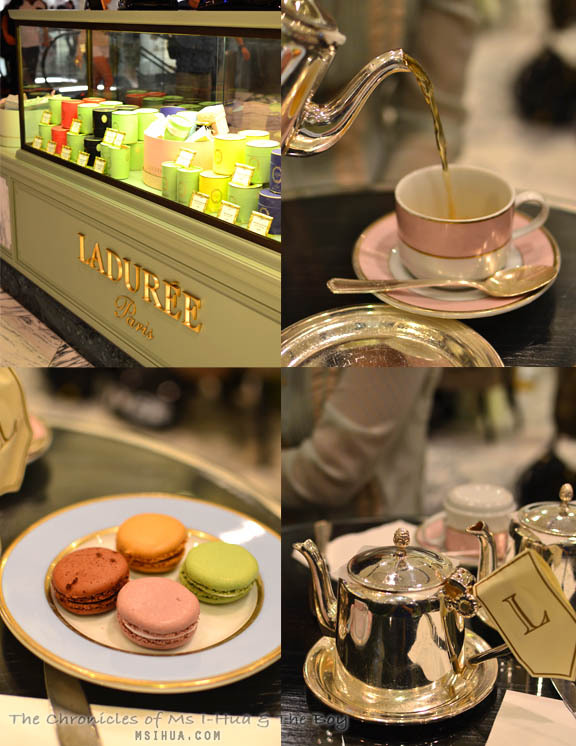 ), we decided to cave in to the innate tourist in us and donate our hard earn dollars to Ladurée. We couldn’t help it! Blame it on the supposed hype (there were no lines reported when we were there), but we just had to do it. 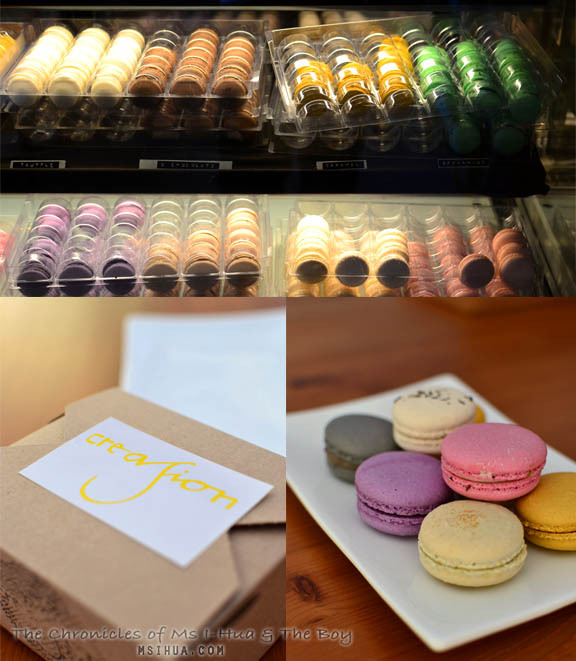 A quick note, the macarons cost more if you eat there than if you were to be clever and buy them to take home. However, eat there we did. All this to soak up the atmosphere and also to rest my poor aching feet. I would never have voiced it out loud, but The Boy (bless him) sensed that I wasn’t going to admit that traipsing all around Sydney by foot was killing me, so insisted we pause for tea at Ladurée because he wanted to (that’s why I married him). We tried 4 flavours which included Salted Caramel (sweet and nice but lacking in the salty department); Pistachio (loved the marshmallow filling); Blackcurrant Violet (the thick jam encased between the shells reminded me of a childhood sweet called Sugus); and Santa Domingo Chocolate (which was rich and tasty). To be honest, I don’t think eating Ladurée macarons outside of France will ever do the macarons justice. The texture of the shells just doesn’t quite cut it. The flavours are there, but I think in trying to maintain the quality of the macarons and to keep the recipe safe, they have sacrificed the integrity of the actual taste in their chain stores outside of France as it’s not as fresh after being blast frozen in Switzerland before being shipped and defrosted overseas for sale. 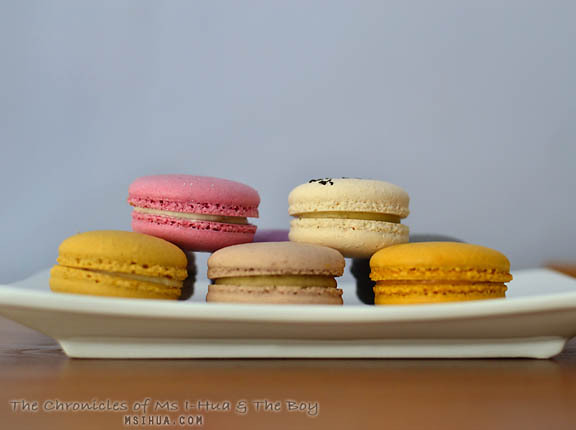 I would very much prefer the macarons at La Belle Miete, Cafe Cre Asion, Luxbite and Zumbo over the Ladurée ones in Sydney. Wow, it’s possibly a good thing I didn’t know about these places before we went on our trip … there was quite enough food consumed as it was! Lemon Drizzle? Shall have that in January then! Yayy! I don’t think I could ever live there.. I’d miss Melbs cafes and coffees too much! Looks like you had a good trip this time round! This post speaks to my heart. KINAKO!!! 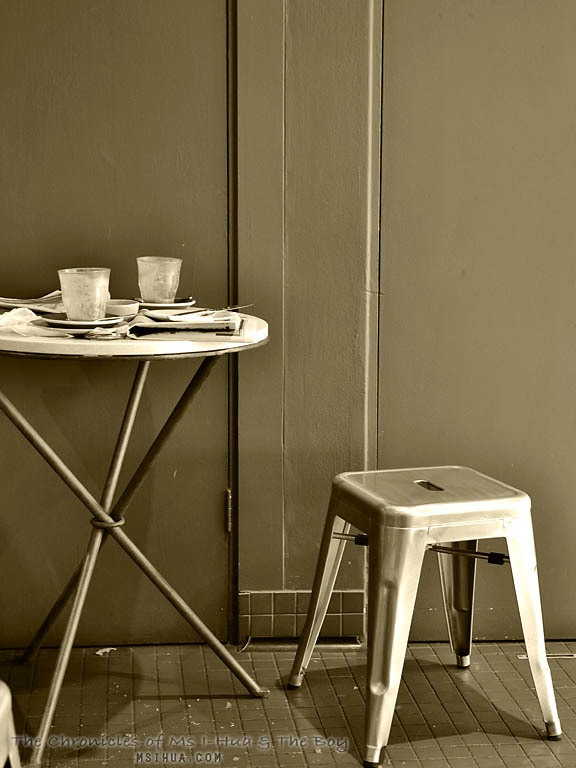 I simple MUST thank you for instagramming and recommending Black Star Pastry! The watermelon cake is amazeballs! Flour and Stone used to be my must-eat when I visit, looks like I’ve added Black Star (and Gumshara) onto the list! Love love love all the sweet yummy treats! 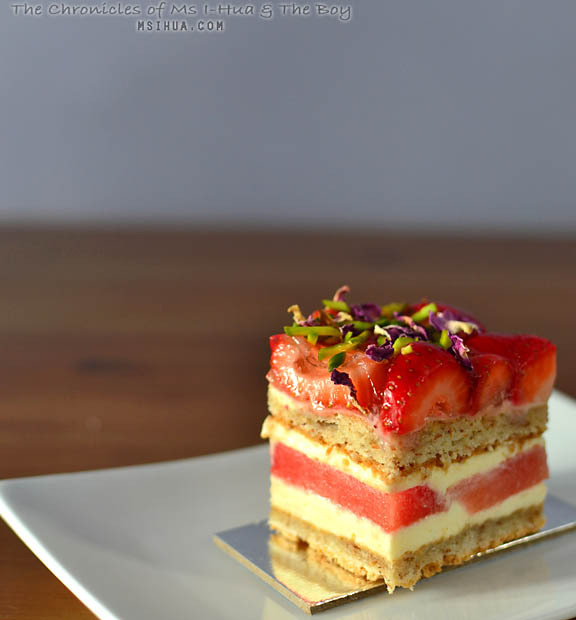 The last time I had Strawberry Watermelon cake from black star pastry was more than 3.5 years ago but I can still remember how refreshing and good it was! I wanna go back again! i hope you enjoyed sydney! come back soon and give me a shout out! I never have enough time to catch up with people when I’m there! so glad you got to visit all these places – top notch for desserts! And I feel the same way about laduree. Nothing beats the original in France! Definitely a sweet visit to Sydney! 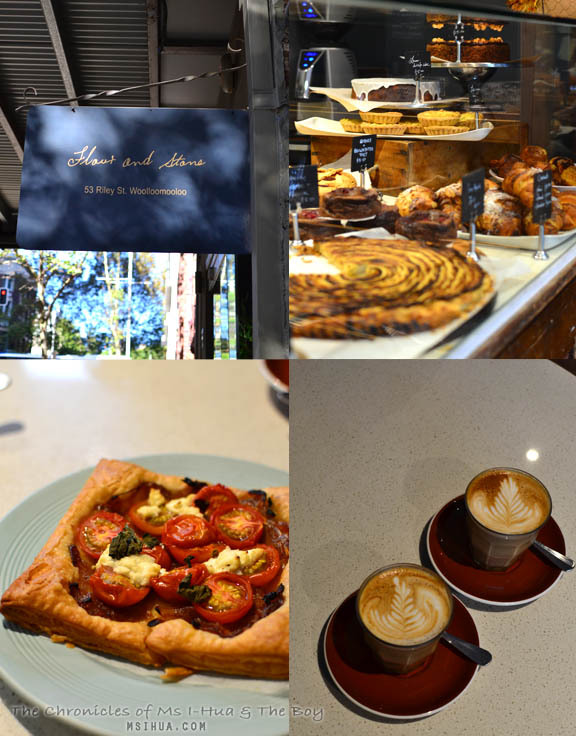 You hit up all the great spots – although I always recommend the ginger brulee tart at Bourke St Bakery too! Ooh I need your expert guidance when we are up there next!